New. 2 CDs in clamshell. PLEASE NOTE, WE DO NOT SHIP TO DENMARK. New Audiobook. Shipped from US in 4 to 14 days. Established seller since 2000. Please note we cannot offer an expedited shipping service from the US. Based on more that 1200 interviews with participant in the Great Migration, Wilkerson's book is much more an oral history and a work of literature than it is an academic study. Some earlier studies of the Great Migration have focused on the years of WWI and its immediate aftermath, but Wilkerson studies the 1930s,40s and 50s. She explores in detail the lives of three people who migrated during these decades. The first migrant, Ida Mae Brandon, was a sharecropper in eastern Mississippi. At the age of 16 she married George Gladney who worked on a plantation owned by a man known as Mr. Edd. When men in the neighborhood beat and nearly killed a man based on the false accusation that he had stolen Mr. Edd's turkeys, the Gladneys knew they had to leave. They took a train to Milwaukee and soon thereafter moved to Chicago where Ida Mae lived from the 1930s to her death in the 1990s. Of her various subjects, Wilkerson seems fondest of Ida Mae and tells the story of her life in Mississippi followed by her life in Chicago against the changing backdrop of American history and African American life. Robert Joseph Pershing Foster grew up in the small town of Monroe, Louisiana where his parents taught at the segregated Jim Crow School. Ambitious, aggressive, and intelligent, Foster studied at Atlanta University where he married Alice Clement, the daughter of the famous president of the University, Rufus Clement, who had fired W.E.B. DuBois. Foster became a physician and a surgeon and his ambitions were far broader than his opportunities in the Jim Crow South. After a period as a surgeon in the Army, Foster left the South on a long nightmarish drive to California in the 1950s and settled in Los Angeles. He worked himself up to a highly successful medical practice, centering upon other migrants. Foster became Ray Charles's doctor, and Charles wrote and recorded a song about him. Almost as fond of the casino and racetrack as of medicine, Foster lived lavishly and threw extraordinary parties to demonstrate how far he had come from life in the South. While admiring his drive, intellect, and success, Wilkerson is uncomfortable with the way in which Foster abandoned his roots and with his life-long insecurities not far below the surface of his material success. The third protagonist, George Swanston Starling, lived in central Florida near the town of Eustis. Intelligent and ambitious, Starling completed two years of college. When his father could not afford further education, Starling married a young woman, Inez, on the spur of the moment and probably out of spite. The marriage proved unhappy but it endured. Starling took a number of low paying and difficult jobs picking fruit. He was forced to flee for his life when he tried to organize the workers and learned that the bosses were likely plotting his death. He and Inez took a train to Harlem in the late 1940 where the unfortunate marriage endured until Inez' death after 44 years. Starling worked as a porter on the railroads where he witnessed and subtly assisted many other African Americans leaving the South in pursuit of a better, freer life. Wilkerson juxtaposes the stories on these three people, who never met one another, throughout the book as they left the South and faced the America of the North, Midwest, and West. Their stories are told with flair and passion. I felt I knew Brandon, Foster, and Starling, and could share their hopes and sorrows. Much of the writing is stunning, including the long claustrophobic chapters recounting Foster's lonely drive from Louisiana to Texas and the endless instances of discrimination and rebuff he faced along the way. Wilkerson tells the stories of her protagonists while also giving the story of the era. She describes the lynchings, discrimination, and many indignities of black life in the South which prompted her characters to leave. She also describes the more subtle discrimination in the rest of the United States. While her protagonists were able to vote, earn money, and succeed to an extent that would have been unlikely in the Jim Crow South, their lives were not easy and the transitions were severe. 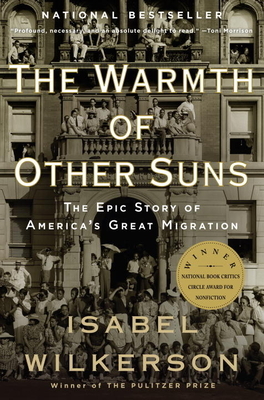 Her chapters describing her protagonists are interspersed with broader chapters and passages describing American life in the South and in the places in the United States in which the migrants resettled. Wilkerson takes issue with some prior treatments of the Great Migration. She argues that in the main the migrants constituted the more intelligent and ambitious portion of the South's African American population. She maintains that their birthrates were lover and educational levels higher than African Americans who lived outside of the South, that their families tended to be more stable, and that they were less likely to be on welfare. She emphasizes individual initiative and drive, the dehumanization of Jim Crow, rather than economic factors, such as the development of mechanized cotton picking, as the primary reasons for African American migration from the South. Wilkerson's book of about 650 pages is written with lyricism and love more than with the dispassion of the historian. It captures a people and an era. This is a wonderfully human and insightful book about a part of American history that remains too little known. ..to put in the amount of research she did and weave it into the great narrative you'll find in these pages.